THE CITY EMPLOYEES who worked overtime to clean up the overwhelming mess of the raucous St. Patrick’s Day celebration all deserve medals as far as I’m concerned. Unfortunately, these hard-working public servants were represented on Savannah’s biggest day in part by a City Alderman who was publicly intoxicated while carrying out duties of his office. 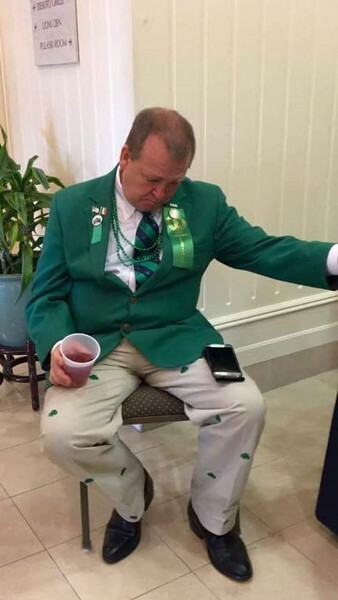 As everyone has seen by now, Sixth District Alderman Tony Thomas was photographed in a state of heavy inebriation in the lobby of the DeSoto Hilton on St. Patrick’s Day, literally falling out of his chair and spilling his cocktail on the polished marble floor. He was wearing a green jacket and the regalia of an elected official and public servant while representing the City on the taxpayer-funded City Council float. Thomas ended up having to be escorted — at the front of the City parade delegation! — because he was too much of a liability to be on the float itself. Perhaps symbolically, a mostly inert Thomas was helped off the floor by an out-of-town police officer or firefighter here to walk in the parade. 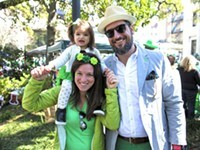 Here’s what that uniformed public servant will tell his friends, family, and colleagues back home in New York or Chicago or wherever: In Savannah even City Council members get blasted out of their minds on St. Patrick’s Day, and no one seems to care. They do it right out in the open. Thomas later apologized for his state via Facebook, but then again his behavior has been the fodder for social media, and this column, for years. 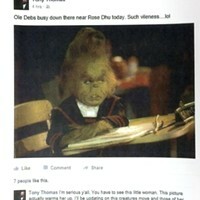 It appears that Tony Thomas needs to seek professional help. 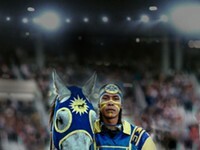 I hope this very shaming incident can serve as a catalyst to get the help he needs. Who is responsible for enabling the behavior of Tony Thomas? The rest of City Council, which after many similar incidents still refuses to censure him publicly? Thus ensuring that Thomas continues to undermine not only Council’s own credibility, but that of hard-working City employees as well? How about the local District Attorney, who impaneled a grand jury to investigate claims which were already known to be outside the stat ute of limitations? Thus ensuring that nothing came of said claims? 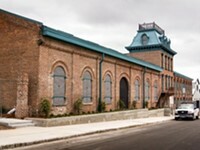 How about Savannah itself, for making millions of dollars a year encouraging excessive alcohol consumption on St. Patrick’s Day, and indeed all year-round? About the same time the incriminating photos of Thomas began making the rounds on social media, I checked out the post-parade scene at Ellis Square, packed with a huge but peaceful crowd. In a group of other people laying in the grass in various stages of drunken immobilization, one young woman rolled over, got on all fours, and vomited heavily, in front of everyone. People walked by like it was nothing. She simply rolled back over and passed out again, steaming pile of vomit inches from her face. Fifty feet from her in the square, a group of young men with unleashed dogs were smoking joints unmolested as police foot patrols walked just yards away, looking right at them. A few squares away, in Chippewa and Lafayette, the huge piles of litter left behind were jaw-dropping even by St. Patrick’s Day standards. And these are the “well-heeled” squares, generally staked out and claimed by local families. 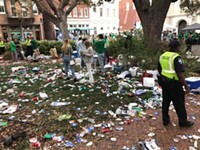 Don’t get me wrong — I’m thankful police used common sense and discretion and didn’t escalate what was a mostly peaceful St. Patrick’s Day in Savannah. Kudos to SCMPD and other law enforcement agencies for a job well done. So if you’re mad about Tony Thomas doing the same thing tens of thousands of others did on St. Patrick’s Day, except while representing taxpayers, I’m right there with you. He should be held to a higher standard, no doubt about it. But please, just spare me the moralistic hypocrisy. Speaking of hypocrisy, let’s switch locales. Let’s take a trip to Tybee Island. Next month, a similarly raucous annual event takes place there, Orange Crush. Just like St. Patrick’s Day, people at Orange Crush will get drunk and high. People at Orange Crush will litter. People at Orange Crush will misbehave. 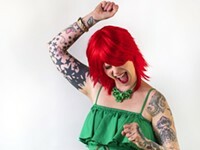 But while Savannah sells St. Patrick’s Day hard, and looks the other way at just about anything that happens– including elected officials literally falling down on the job — Tybee does its best every year to stigmatize Orange Crush. As videos clearly indicate, there is no way that there is more trash produced at Orange Crush than at St. Patrick’s Day. As arrest records clearly indicate, there is no way that more crimes are committed at Orange Crush than on St. Patrick’s Day. Yet which event is considered “good old-fashioned fun,” and which is considered a dangerous, drunken menace to society? The difference of course is that Orange Crush is an overwhelmingly African American event, the St. Patrick’s Day celebration predominantly white. One of my epiphanies this year came when a group of green-clad partiers, drinks in hand, stumbled out into the middle of traffic, staring down drivers who had to slam on brakes. There would even be calls to shut the whole thing down — indeed as is the case on Tybee every year. So let’s not kid ourselves about what we’re really talking about here. If you want a discussion, let’s make it a real discussion, and a brutally frank one. If you live in the Sixth District, which I don’t, perhaps you can vote Thomas out at your next opportunity. Or maybe you’ve decided, as many of his constituents have, that his service to the district outweighs his public persona. Until then, the onus is on other members of City Council to expect more from their colleagues, and do something about it — even if Thomas won’t.